As far as retirements go, Floyd Mayweather’s has been a busy one. The 42-year-old boxer has recently made it a practice to take on non-boxers in the boxing ring and walk away with millions after a nearly risk-free victory. He outlasted a gassed Conor McGregor in 2017, ripped through Japanese kickboxer Tenshin Nasukawa last New Year’s Eve and publicly flirted with another bout against Khabib Nurmagomedov while the world waits for a second Manny Pacquiao fight. 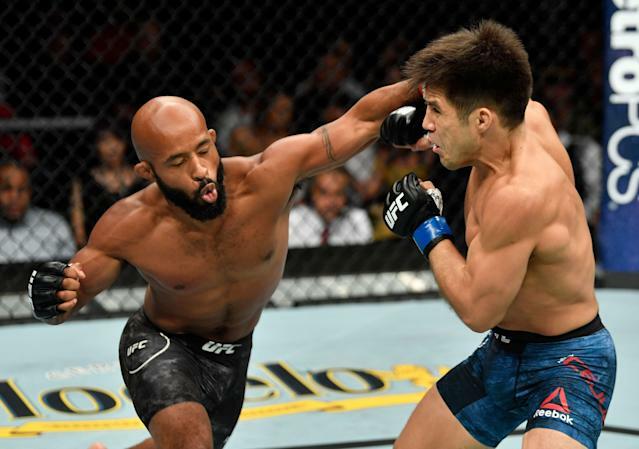 Now, former UFC flyweight champion Demetrious Johnson appears to want that action. "Absolutely, I'll step in there and fight Floyd," 32-year-old Johnson said ... "3 rounds? Just boxing? I'll do that. It'll be fun! I feel like I'll do fine." And, this isn't one of those hypothetical matchups either -- because as Johnson put it, "I think for Floyd Mayweather if it makes money sense, I think he would do anything." At least Johnson seems to know what motivates Mayweather. Now, how would such a fight play out? Johnson is considered one of the best mixed martial artists in history thanks to his incredible run atop the UFC’s flyweight division. The 32-year-old set a record with 11 straight title defenses until he was stopped by Henry Cejudo last year. That’s what Johnson has going for him: sheer greatness in MMA’s biggest promotion. What he doesn’t have going for him: He’s not really a boxer, and he’d be facing a historically great boxer who has five or six inches of reach and a weight class or two on him. Unlike the strike-focused McGregor, who lasted 10 rounds with Mayweather, Johnson is much more of a wrestler. That limitation might have been a big reason the Nurmagomedov fight never came together, and it’s why a Johnson-Mayweather fight wouldn’t be as entertaining as some fans might imagine. It might be lucrative though, and that’s really what matters here.